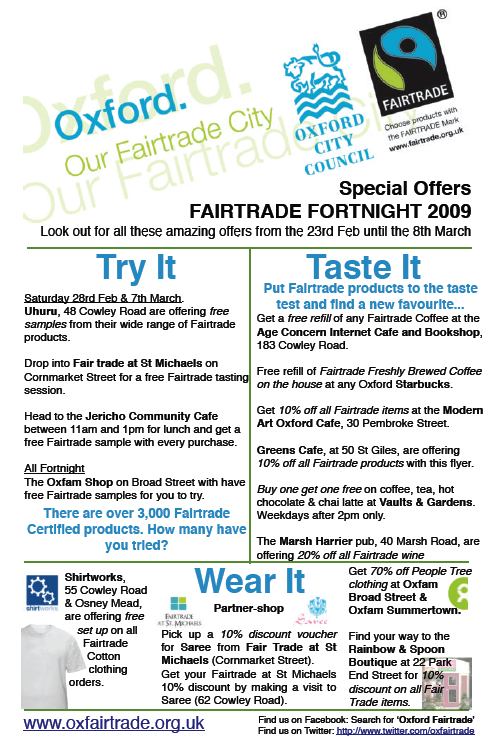 The Oxford Fairtrade Coalition have been busy talking to retailers across the city to put together an amazing leaflet packed full of special offer to make it even easier to Try, Taste and Wear Fairtrade products this Fortnight. We have offers from all the following retailers. The offers will be posted here online in a few days – but if you want to get a sneak preview – make sure you are signed up to our Facebook Group or following us on Twitter where we’ll be sharing all the offers first. This entry was posted on Tuesday, February 24th, 2009 at 12:14 pm and is filed under Fairtrade City. You can follow any responses to this entry through the RSS 2.0 feed. You can leave a response, or trackback from your own site.